I love finding handmade products ~ Pretty Peacock makes some beautiful jewelry. They are located in a small studio just north of Seattle. There jewelry incorporates gemstones and texture. This is the piece that I have and I really love it. 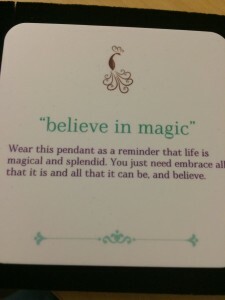 It is the “Believe in Magic” piece. 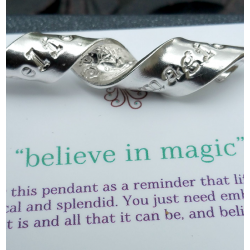 It is made out of solid sterling silver and has believe in magic stamped on it – and it looks like a curled ribbon. It comes a a very pretty 18 ” chain that is very delicate looking. It arrived in a purple package and comes in a nice box. It came with this card – reminding you that there is still magic out there you just have to look for it! All of the pieces that Pretty Peacock makes has love and thought in them. Each item tells your story. They have a nice variety of jewelry so you are sure to find a piece that you love or want to give to someone you love. If you are looking for the perfect Gift make sure you look at all the lovely items at Pretty Peacock. My readers get to save big! Pretty Peacock: FAMILY2015 and for 30% off the entire site valid until 12/31/15! National and Abroad.